The other day I followed the route of the Grand Raid short course from Evolene over to Grimentz. This starts (obviously) uphill from the village, heading for the distant Pas de Lona. There's a great singletrack section through woods below Eison. Great riding but it's downhill, which means more up...A quick climb to Eison leads to some uphill singletrack through woods - surprisingly tricky climbing. Then it's back to forest track for a while. A long while! Emerging from the woods means fantastic views if you can spare the energy to look, then more tricky track leads to the final infamous carry to the col. Climax of the Grand Raid this is hard work, carrying a bike for around 300m vertical metres. 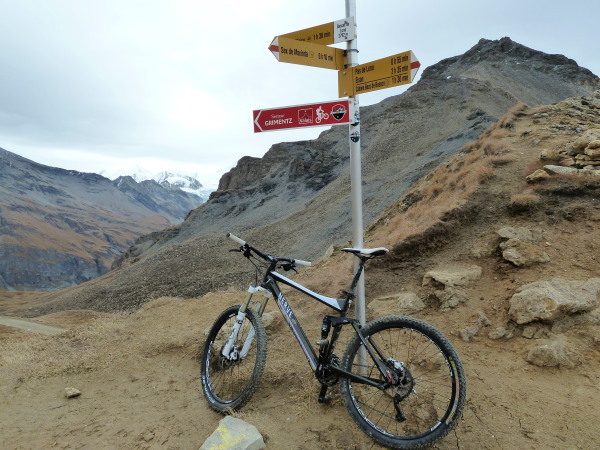 The col has great views of the Swiss 4000m peaks - and a fast, twisty, singletrack descent. Then it's back to first gear for the final climb over the Basset de Lona. Not far, but very tiring especially if you started from Verbier. 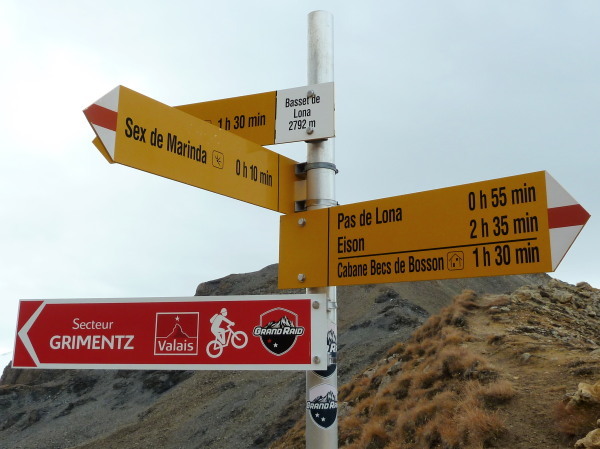 From the Basset it's downhill to Grimentz, "only" 1200m below the col.